The Group has presented commendable results in a challenging environment during the period under review. The results confirm the expectations of the first part of the turnaround strategy announced in last year’s report, and present the Group with a solid base from which to grow. 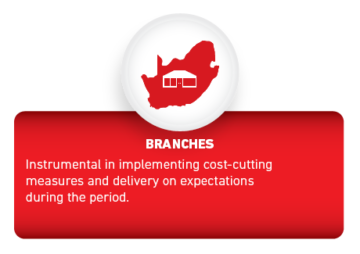 In particular, we would like to acknowledge the branch managers who have been instrumental in buying into the cost-cutting measures that were introduced as part of the strategy, and who in the main have delivered on expectations. The second part of the turnaround strategy will now shift to head office, where significant further efficiencies have been identified and will need to be realised in the forthcoming financial year. The predominant theme for the year under review is that the turnaround strategy is resulting in the expected outcomes. What is pleasing is that this improvement has been driven not only by the reduction of costs as expected, but also by top line growth. The Group produced an 8% increase in revenue to R1,42 billion, compared to the R1,31 billion achieved in the 2017 financial year, mainly contributed by the Goods and Services segment, which was up a pleasing 14% year on year. Trading margins were under pressure, given the weak economic environment. However, given the improved product mix and margin management, the average margins increased to 28% from 26%, which management believes can improve further and thus is targeting a 30% margin. Overheads continued to be well managed, and reduced from R358 million to R332 million, notwithstanding once-off costs related to the turnaround. The second part of the strategy should yield a further cost reduction in the forthcoming year, of a similar quantum. As a result of the above, we are pleased with the Group’s return to profitability, with headline earnings per share of 8,09 cents per share, up from a headline loss per share of 7,45 cents per share in the comparable prior year. The Group’s continued focus on working capital management has ensured that our operations remained cash generative, resulting in increasing headroom of R30 million in our working capital facility when compared to last year. Net working capital at 28% (2017: 30%) of revenue is improving within our 2018 target range of 25% to 30% of revenue; the mid-term goal is to reduce this to the 20% to 25% of revenue range. This will remain a key management focus, especially in a geared environment, where cost of funding and interest paid remains a material expense and a drag on earnings. The Group’s after-tax return on average equity in the current year is 15%, as compared to a loss of 4% achieved in the prior year. The return, whilst significantly improved, clearly reflects much is still to be done on both the growth side and the cost side, and management is well aware of this. Further detail on the financial results are set out in the annual financial statements and accompanying notes. Notwithstanding the challenging economic conditions and reduction in consumer spending, the Consumer segment fared well, improving turnover to R1,42 billion, up from R1,31 billion in 2017. What is also pleasing is we managed to grow the top line whilst still being able to increase the gross profit percentage from 27% to 28%. Operating expenses reduced by 7%, from R350 million to R326 million this year. Management is targeting a similar reduction in the forthcoming year, largely through efficiencies at head office. The segment returned headline earnings from continuing operations of R42,7 million, up from a loss of R12,9 million last year, representing headline earnings per share for continuing operations of 6,88 cents, an increase from a loss of 2,08 cents per share last year. The satellite market remains robust and exceeded our internal forecasted numbers, whilst other product lines held their own, which was pleasing given the highly competitive environment. Ellies continues to be an environmentally-aware-organisation, and is gradually becoming a more recognised brand in the renewable/energy-efficient sector, mainly focusing on PV and alternative energy-efficient products and solutions. In the Corporate Lighting division, investment in the product line is starting to bear fruit, with several blue-chip clients having been signed up. Management remains optimistic that this particular area will grow exponentially during the forthcoming financial year. 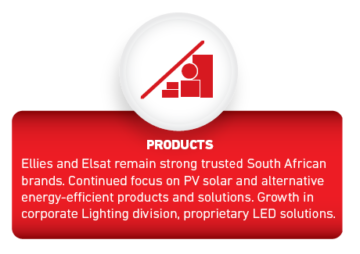 Ellies and Elsat remain strong South African brands that are trusted and found in most homes in Southern Africa. 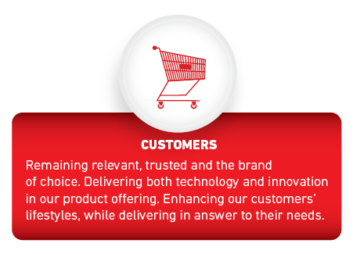 We will endeavour to continue to grow the brand and remain a trusted technology leader in all our categories. The arbitration in which the operating entity Botjheng Water (Pty) Ltd (Botjheng) is involved against Cooperative Muratori Cementisti Ravenna (CMC) and which was expected to be heard in February 2018, was postponed by the arbitrator until July 2018. As such both Botjheng and its holding company, Ellies Infrastructure (Pty) Ltd, are classified as continuing operations. On finalisation of the arbitration, management will commit to a disposal and/or wind down as applicable. It should be noted that if the case is not successful, a profit on loss of control in excess R75 million will be recognised, (non-cash flow). On 24 July 2018, Botjheng and CMC, entered into a Settlement Agreement, the substance thereof being that CMC agreed to pay Botjheng a net USD2.25 million in full and final settlement for all claims each party has against each other. The effect of the settlement will be that the contamination to Standard Bank (Note 19 – Guarantee provision) will reduce to R47 million. No new corporate activity was undertaken during the year, and none has been committed to at this stage, other than as disclosed in the Consumer and Infrastructure segment information, acquisitions and further diversification of the Group and, as a result, its product offering, will become an integral part of Ellies’ growth strategy. shareholders, on an ongoing basis. The risk will also be referenced in terms of cost, cash generation, independent oversight and specific know-how of the potential target’s industry. The current trading environment is tough and is not expected to change in the foreseeable future. 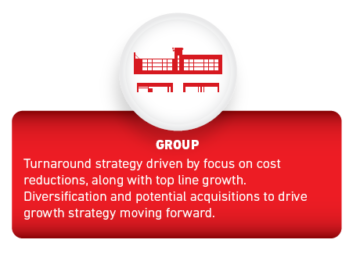 The Group remains focused on optimising operational efficiencies within its existing business and will accelerate this, particularly at head office. 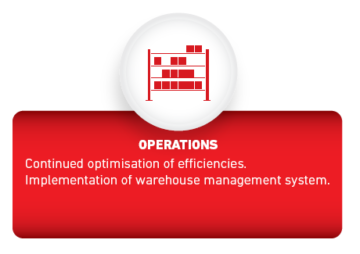 We are in the process of implementing a warehouse management system and will look to overhaul the way we do business by embracing digitisation, IT and accounting electronic workflow management. The way we interact with our suppliers and customers will change significantly to reduce the cost of doing business. The Group will also seek out strategically aligned trading and distribution-related acquisitions, as alluded to above.